As reported by Automotive News, Jim Peruto, a dealer in Pennsylvania, is considering – reluctantly – the purchase of a new building for his dealership. This new facility will replace the existing store that cost $20 million to build just six years ago. “Mercedes-Benz told me it was their most beautiful dealership in the world before they told me that I didn’t conform”. Mr. Peruto plans to move the Honda franchise into the existing MB plant. Just a question: even if stunning and overdimensioned, it will be in accordance with the new standards of the Japanese brand? For the majority of dealers these are really hard times: every day newspapers reiterates news on the ‘massacre of the dealers’; but this situation is also clearly reported in the Italia Bilanci Dealer Report that analizes the 2010 budgets of the dealers and estimate that more than 50% of them is loosing money today. Many, too many. 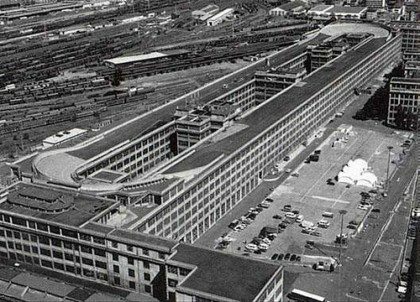 What amazes is that even today, despite the dramatic present situation, in spite of promises and statements of ‘partnerships’, many OEMs returned to attack their networks with new contractual standards, revamping of the showroom, rebuilding of the workshop. Investments that nothing have to do with selling cars. Certainly it will increase the financial pressure on the already worn resources of the Dealers. It is therefore wrong to claim standards and brand identity? NO! Who develops multi-billion dollar investments in new products, he is right when he wants to ensure – in his distribution chain – the correct image of the brand and a certain decorum: it can not be accepted the dealer without heating in winter, with 20 years old insignia and a dusty old showroom. Or worse. But, gosh, however it doesn`t make sens to check if the battery of a car into the showroom has enough power, or if the logo on the cups of the wheels is horizontal, when the toilets are stinky and dirty. There is a limit to everything! Here are two interesting stories: a Premium OEM has recently started a ‘restructuring’ process of its network. Current and new dealers have dedicated space and set up – or revamped – their showrooms according to the policy of the standards. This summer – in June and July – I visited some of these dealer that with enthusiasm – but also with a little ‘superficiality’ – have converted and revamped their plants overspending – or rather investing, as used by the OEMs language – hundreds of thousands of Euro in flooring, lamps, chairs and carpets, decorations, planters signs, desks, panels, paintings. But also in equipment, software and hardware, spare parts, accessories and demo cars. The factory in the northern part of Europe, which was expected to build cars – and announced new breaking models – has stopped the production since last March. Technically it is … in serious trouble. And even if there will be not a bankruptcy, before the production of current models will restart up again, it will take months. Subject to the payment of suppliers and salaries. Today the new showrooms set up by the dealers – according to the current standards of the NSC/OEM – are completely empty. Or it contain new cars lots of other brands. Correct: optimize resources! Another manufacturer, during 2010 – in anticipation of the arrival of new products – has ‘persuaded’ the whole network to renew the showroom buying the “usual”: lamps, rugs, mats, display lighting, flooring, accessories, but also bicycles, accessories and other merchandise. Average cost for this revamping, according to the dealers I interviewed, about 30,000 euros per outlet. 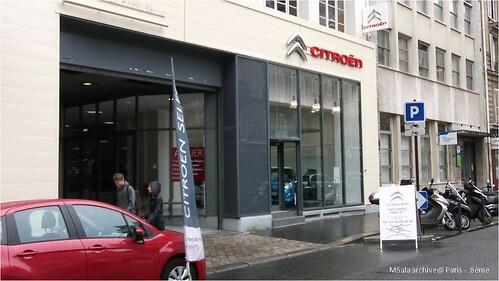 A few days ago during a business trip to Paris, I visited some dealers of this brand and found that the policy of the ‘brand identity’ has changed and now they are experiencing the ‘neighborhood dealerships’. Interesting, isn’t it? In the same day I visited the extraordinary showroom of another OEM, located along the ‘champs elysees’. It seemed to be at the NAIA Detroit Auto Show, not into a dealership. But when I entered with another prospect, we look around, we waited 20 minutes and no one has ever spoken to us, neither greeted us or asked us what we wanted. Wow! 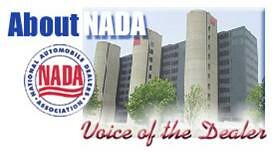 About contractual standards, revamping and adjustments of the showrooms, please give a peek to the “counteroffensive” of NADA in the US to fight against incongruent standards that OEMs are trying to impose. GM reinstated the program after dealers agreed to modifications. Dealers also will be allowed to buy equivalent materials such as tiles and office furniture from a local company instead of the manufacturer-designated vendor. Somewhat changed also with the politic help: Dealers in some States now have 10 years after a facility renovation before they can be made to change the remodeled area again. In other States, special local laws are requiring manufacturers pay 80 percent of that per-vehicle incentive even to dealers who forgo renovations. Elsewhere the ‘blue law’ allows dealers to close at least Saturday or Sunday. I believe that cars are sold by the Men (and Women) speaking with customers, not by facilities and glittering showroom. But I also perceived that in the glittering plants, sometimes, salesmen snubbing customers or forget to ask them name and phone number! 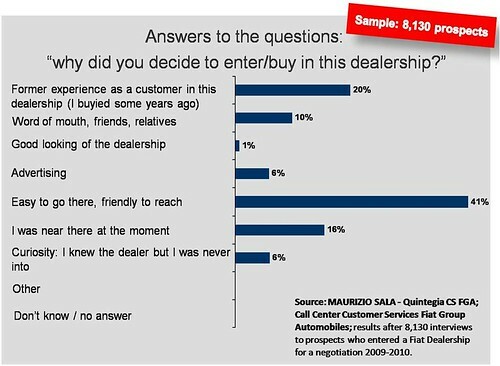 Yet analyzing the interviews made by a generalist OEM who asked to more than 8,000 prospects “why did you decided to enter this dealership”, it follows that – besides having a strategic position – the dealer should invest more on ‘word of mouth’ and an excellent customer satisfaction rather than on generic advertising. It’s amazing to see that the appearance of the showroom and structure affects only 1% of the prospects! The marketing offices of the OEMs did not developed any of these enquiry? Heck, but it’s not just the fault of the OEMs if the quality and attitude of salesmen are bad. Those salesforces they work into the showrooms of private companies where the Entrepreneur should protect his investment and consolidate the profits! In the development of contractual standards – for the OEMs– it is easier to ‘push’ on structural aspects (whose requirements can easily be shown to the mega-galactic-directors at the Head Quarter on Mars) rather than investing in standards/projects more difficult to measure, like all that involves the ‘Human Capital’! The current NADA President, Stephen Wade, recognizes the need for standards, “but they should be realistic.” Dealers say financing for upgrades is tough to secure, and automakers can’t guarantee a single additional sale because the new floor is a darker shade of gray. Holy words! Customer Satisfaction? Fix It Again Tony! During the Exxon-Mobil1 AntiCrisiDay – – a couple of days ago, some influential actors in the automotive, predicted new scenarios in short-times for the Automotive. Including a new ‘policy’ of the OEMs with standards; this will be a source of debate both in Europe and the U.S. But while in US someone is already protecting the interests of dealers, in the rest of the world and especially in Europe what will happen? We lost our Nissan dealership due to the financial struggle that the oem requiring us to build a new fancy building. Later found out that the 9 mill building project would net the Nissan company a 30% profit…when car sales slow, they make up the profit on the dealer. Never allowing you to purchase product locally, claiming standards must be kept and product MUST be purchased thorugh a source that kicks back a percentage to who?? ?Nissan of course. Wow Sissy, thanks for your contribution! But believe me, even in Italy OEMs and their NSC develop a great part of their incomes ‘through’ and ‘on’ the Dealers, selling ‘non-captive’ materials that nothing have to do with their core business. I’m not just talking about revamping the showrooms and all these materials as floors, chairs, planters, insignia and totems sold to the dealer at the double of its commercial value: but also roof racks, satellite navigation systems, tyres and… motor oil! Did you ever purchased a ‘best in class’ motor oil directly at the vendor? Not only the price will be greatly better, you’ll also receive a commercial or marketing consultancy and a premium service directly at your service department. Not forgetting the danglers, stickers and showrooms adobes to be used during Sunday events or during the launch of new products: paperboard sold at the price of gold! But this is part of the ‘game’; this is the price of the business ‘partnership’. If the manufacturer puts the dealer in the condition to earn money – then – they could pretend from the entrepreneur any kind of reasonable investment. But if the dealer don’t make money due to wrong commercial policies of the Carmaker, or due to obsolete products, or stocks exaggerated and too much pressure… any request of unnecessary investment coming from the OEM is not justifiable. Wow! This is some interesting information. It is true that dealership spend lots of money on this type of marketing hoping to get a prospect to walk in the door. Ciao Ashley! Thanks of your comment. Please feel free to forward this article and the information to your network! Have a great day! SELLING FIAT? A NOVEL OR JOURNALISTIC INVESTIGATION? Cut throat pricing is making business marginal. Is there room for net pricing in the automotive industry?